tect hard-to-clean spokes and rims from dust and dirt. 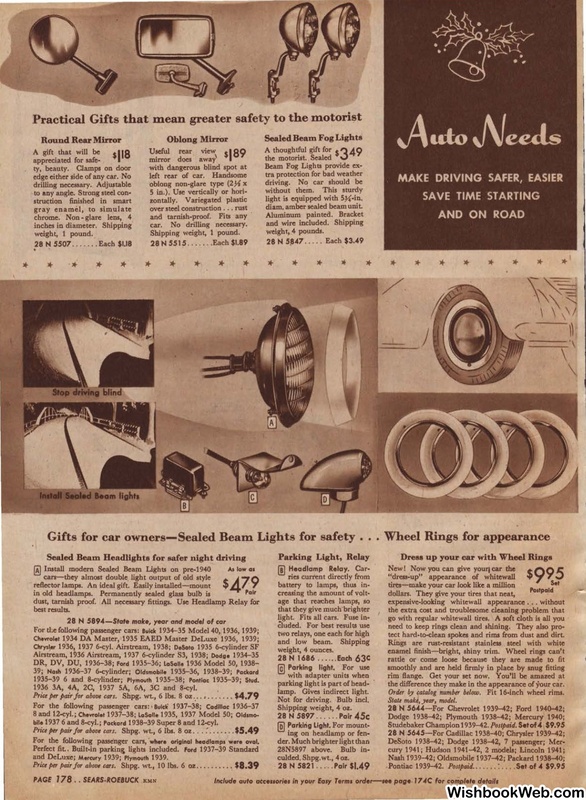 1935-39 6 and 8-cylinder; Plymouth 1935 _ 38 ; Pontiac 1935 _ 39 ; Stud. 1936 3A, 4A, 2C, 1937 SA, 6A, 3C and 8 -cyl. the difference they make in the appearance of your car. Price per pair for .above cars. Not for driving. Bulb incl. bi!e 1937 6 and 8-cyl. ; Packard 1938-39 Super 8 and 12-cyl. Price per pair for above cars. For the following passenger cars, ·where ariglnal headlamps were aval. and DeLuxe; Mercury 1939; Plymouth 1939. Price Per pair for abo!J4 cars.